The Africa Cabinet Government Network (ACGN) has been established to provide formal and informal opportunities for collaboration and mutual support between Cabinet Secretaries and others involved in managing Cabinet processes in Africa. Among the reasons is a desire to share knowledge and experience on steps taken to improve the procedures and capabilities of Cabinet Secretariats, especially to improve evidence-based policy-making. H.E. 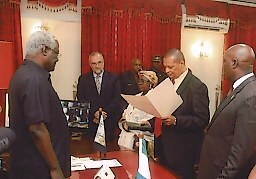 Ernest Bai Koroma, President of Sierra Leone, (left) swears in Ernest Surrur (second from right) as Secretary to the Cabinet and Head of the Civil Service, March 2013. 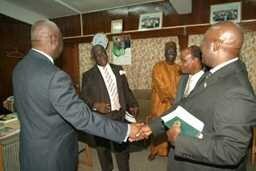 The ceremony was attended by Mark Johnston, Executive Director of ACGN (second left). The Charter of the organisation was approved at the first Roundtable workshop in Addis Ababa in February 2014. A revised Charter was approved in April 2016 at the third Roundtable meeting in Malawi. ACGN also assists with capacity building activities to address common problems facing Cabinet decision-making processes, from both peers and technical advisers with practical experience in Cabinet decision-making processes. Our earlier initiatives included the first roundtable workshop for Cabinet Secretaries in Addis Ababa in February 2014 and a successful exchange between the Cabinet secretariats of Sierra Leone and Ghana in 2012. Since then there have been two more Roundtable meetings and a series of international training workshops (see initiatives). During 2013-16 ACGN was supported by DFID through the 3-year Africa Cabinet Decision-Making Programme. 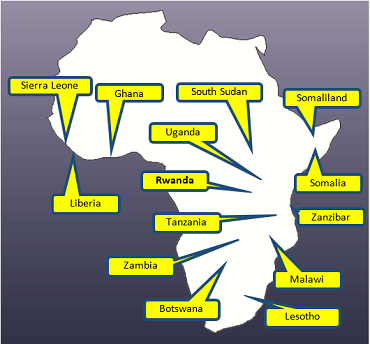 The founding members were the Cabinet Secretaries in Ethiopia, Ghana, Liberia, Malawi, Rwanda, Sierra Leone, Somalia, Somaliland, South Sudan, Uganda, Zambia and Zanzibar. Since then the Cabinet Secretariats in Botswana, Lesotho and Tanzania have joined. Interest has also been expressed by Cabinet Secretaries, Ministers and/or senior officials managing the Cabinet processes in a number of other parts of Africa, including Senegal, Kenya, Egypt and Zimbabwe. This ACGN website will be used to support the network with communications between secretariats, technical papers and reports, as well as relevant links. If you require further information or wish to inquire about membership, please contact: Dr Mark Johnston, Executive Director, by email to MarkJ@CabinetGovernment.net.